"A really quick, easy sauce for 'pasta asciutta,' which means 'dry pasta.' It's not a dish over-loaded with sauce, but one that appreciates the simple smokiness of good smoked salmon. Serve sprinkled with some Parmesan or garnished with some parsley. This is not a creamy, thick sauce. Just one that really brings out the simple, yet fantastic flavors of smoked salmon. Enjoy! " Fill a large pot with lightly-salted water and bring to a rolling boil. Stir the linguine into the water and return to a boil. Cook uncovered until the pasta has cooked through but is still firm to the bite, about 11 minutes; drain, reserving 2 tablespoons of the water. Melt the butter with the olive oil in a saucepan over medium-low heat; when the mixture begins to bubble, add the shallots and cook until softened. 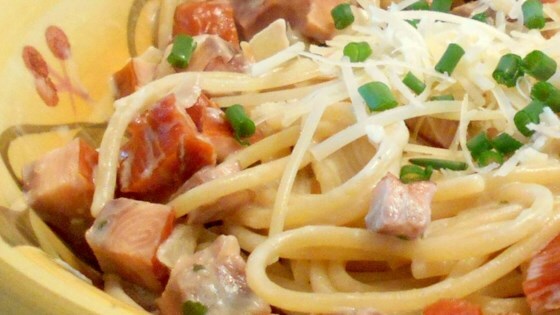 Stir the salmon, cream cheese, and milk into the shallot mixture. Mix the reserved water from the pasta into the mixture. Transfer to a large bowl and toss with the pasta to serve. I added lemon juice at end. It was okay, just needed more flavor. My family and I love this recipe! It is light, yet tasty!